Discount Magic - Cap In Bottle. 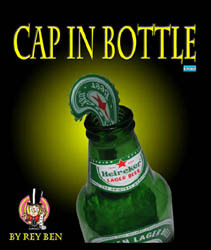 The magician shows an empty bottle of beer and an ordinary bottle cap. Magically, he puts the cap inside the bottle, and shows it to the audience. Then he takes the cap out and hands it out for examination. After putting the cap inside again, he gives the bottle with the cap inside to the spectators, and asks them to try to take it out. Everybody fails!!! This is a refreshing twist on the coin in the bottle trick, and has the ring of being an "impromptu" miracle. The magician takes the bottle and removes the cap. And as a finale (if he wishes) he gives the bottle with the cap inside as a present to one of the spectators. Cap In Bottle The magician shows an empty bottle of beer and an ordinary bottle cap. Magically, he puts the cap inside the bottle, and shows it to the audience. Then he takes the cap out and hands it out for examination. After putting the cap inside again, he gives the bottle with the cap inside to the spectators, and asks them to try to take it out. Everybody fails!! !